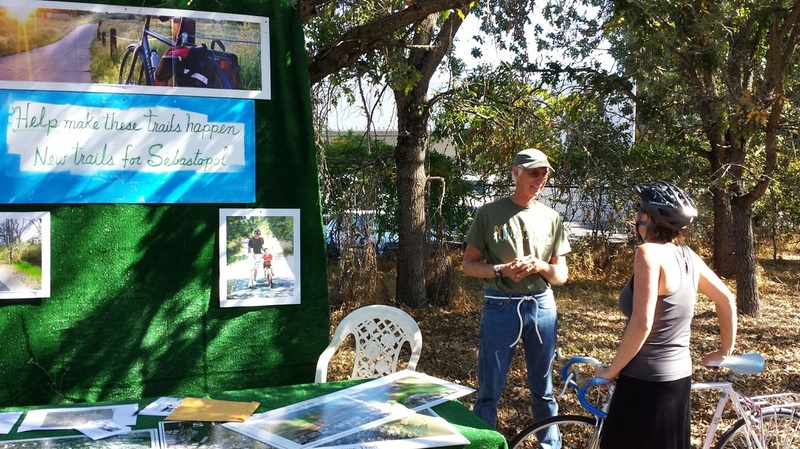 The Sebastopol TrailMakers invite you to get involved in making our town a better place to live by paving the way for more bike and pedestrian trails. We are currently working with the City of Sebastopol to adopt two great bike trails and a new trail head park. These trails will provide safe, scenic, and direct multi-use bike paths that would connect downtown Sebastopol and the Joe Rodota Trail with outlying portions of our community to the south and west. View the proposed trail maps for the "Gravenstein Trail" and the "Apple Blossom Trail" and learn more about how these proposed biking/walking trails can improve Sebastopol’s quality of life. This is a community project that takes community support. We need your help! We need to act now to get the City Council to adopt the trails – or this opportunity will be lost. Learn more about the proposed bike/pedestrian trails that would benefit all Sebastopol residents and visitors. Click above for the first of a 3-part video. Parts 2 and 3 can be viewed below. These well-crafted trail proposals are in place. Nearly every critical property owner is supportive. Grant opportunities abound. It is possible for these trails to be completed in less than five years. These trails will do more than any other single thing to make Sebastopol a better place to live. These trails will change the "drive everywhere" culture of Sebastopol, the health and independence of kids, traffic to schools, etc. These trails will add to social life, happiness, and adventure, from tots in trailers to elders. Dogs love them. More important, these trails will make Sebastopol a better place to live. See poll below. Get our youth started in the habit of going places on their own power. The predominant culture of "drive everywhere" will change by getting youth and families into the habit of biking and walking. This starts with a safe and enjoyable way to do this. Bike lanes along Hwy 116 are not a "duplication"
You still ride between parked cars and highway traffic. Until it feels safe, most will not use bike lanes. We need a way for all users to ride or walk. Walking along Hwy 116 is unpleasant. Should we prioritize developing more pedestrian and bicycle improvements and pathways? 40 of 46 people answered affirmatively, or 87%. It should be noted that the people who did not answer affirmatively did not answer negatively; rather, they did not answer at all. In other words, there were no anti-bike lane comments, which means that support may even be higher than 87%. Please send us an email if you'd like to receive updates from the Sebastopol Trailmakers. We have a town where most destinations are within biking distance. But bikes are seldom used to get around in our town. Most Sebastopol kids are driven on every outing. Most families outside the core area of Sebastopol will not consider letting their kids bike to town. It is because one cannot travel far without riding along a highway -- often between parked cars and highway traffic. It is not safe. We hope to change this for future generations and create a way for safe travel across our wonderful town. These trails will make our town a better place to live in many ways: a healthier population, more social connection with our town, less traffic, particularly in conjunction with school hours, less use of our resources, less pollution – all important values in our community. Plus tourism. Tourists love bike trails as a way to see a community. After wine, bicycling is the number two tourist attraction in Sonoma County. Bike enthusiasts contribute economic value to the County, but Sebastopol is seeing very little of that. These trails would change that. Tourists will appreciate them as much as the community will. Safe? For a half mile along Hwy 116, this is the space to ride to town. Fear of car doors opening, big loud vehicles coming close, swirling dust from trucks, riding with a tight grip and a slight worry -- this is no place for kids, only strong riders. Bike lane stripes will be added here some day, but the space will not be any wider. Half of Sebastopol recreational bike riders drive their bikes to the Joe Rodota Trail because they say there is not a safe way to bike to the trail head. The two pictures below illustrate the need for bike trails. 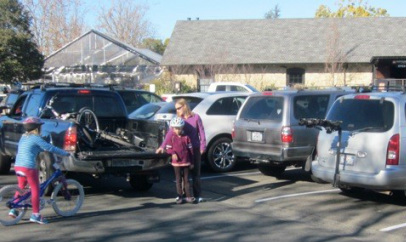 The first picture shows a typical Saturday morning where many vehicles are used to transport bikes to the trail. 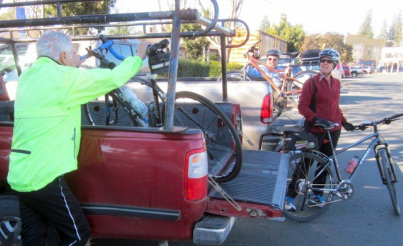 The second picture below shows three people who are Santa Rosa Bike Club members going on a 30-mile ride, but they drive a mile across Sebastopol to start. They do not think it is safe either. The picture below shows a community center and school in Oregon that reports it has 400 bike racks. This community was designed with bike trails. Consider all the cars this gets off the road and the freedom it gives to kids and parents. Sebastopol has a chance to take a giant step in this direction and really be a GREEN community. Our community would love it. The opportunity to have these trails will end. Both trails work because caring people in the community are willing to accommodate this need on their land. These trails cross a series of connecting properties and losing any link will break the chain needed for a trail If any property changes hands and support is lost, then we have lost our opportunity to make Sebastopol a safer place to walk and bike. Unfortunately, there is no “eminent domain for trails.” The Trailmakers have scoured the community for alternative routes and see none. These routes are a gift. It was truly amazing just to find a way for two trails to cross our town. It is even more amazing that essential private property owners are willing to work with the City to allow a trail. Most of these owners are 70+. We have found that many owners, and particularly new owners are not receptive to trails on their land. Life moves on. In other words, if we don’t act now, we might miss our opportunity to make these wonderful trails a reality. Many on the Council have talked about the need for bike trails. However, in the four years since these proposals were introduced, nothing significant has been done. Time will run out. One of two land owners who were the first to agree to a trail. Steve Lang, owner of Sebastopol Memorial Cemetery, which the Apple Blossom Trail will cross, has since had a brain aneurism that required a long recovery. He knows about life moving on. Connie Lesert, another landowner who has agreed to let the Apple Blossom Trail cross her property. Studying or delaying of these projects decreases the chance of them happening. Changing ownership of the private property and new development can end this opportunity. Everybody says they are all for multi-use trails across the neighborhoods of Sebastopol, but some in the next breath throw up road blocks to prevent them from happening. The people that are against something usually talk the loudest. 1. Adoption qualifies the trail for many publicly funded grants for development. The Sate of California passed legislation, The Bicycle Transportation Act, addressing bike trail development. One of the first statements in this legislation is that to apply for public funds for a project it must be in an approved plan – Our Sebastopol Bicycle and Pedestrian Master Plan. The heart of the plan is a map showing existing and planned routes. There are many grant funding sources available for bike trails, particularly for trails that facilitate: kids riding bikes to school, and trails that get drivers off state highways. The Apple Blossom Trail and the Gravenstein Trail score high on the most important requirements to be awarded a grant. Sorry I missed your call. In case it’s not too late, you’d need those pathways to be in the City’s bike plan to be eligible for Transportation Development Act (TDA) Article 3 funding and State Bike Transportation Account (BTA) funding. If paved as Class 1 facilities, then they would qualify for these funding sources, as well as several other Federal, State, Regional and Local pots of funding. Hope this helps…happy sailing. Most grants require a percentage match from the applying agency. According to Gary Helfrich, of the Sonoma County Bicycle Coalition, this is usually between 10 and 20 percent of the needed amount. This could come from City of Sebastopol funds. Or it could come from the public, as in the case of getting the $20,000 match for the CalTrans Grant to study the Sebastopol – Petaluma trail. Sebastopol TrailMakers raised a large portion of this money from donations. What will it cost Sebastopol to build the Apple Blossom and Gravenstein Trails? Not much considering their value to the City. Using the basic numbers provided by Ken Tam, the person in charge of trail development for Sonoma County Parks, and Jeff Peters, principal at Questa Engineering, adjusting for many variables and details, the completed total cost of the two trails would be about $2,000,000. With grants and a 14% match, the cost to Sebastopol is less than $300,000. Much less than the estimated cost of painted highway bike lanes. Because these trails have the potential to lessen traffic on two congested highways, the cost could be even less. Bay Area Transportation Funds for Clean Air (TFCA) will grant 100% funding for projects providing non-motorized modes of transportation. Another program, Congestion Management Air Quality, (CMAQ) requires an 11.75% match. And soon, the City may be able to borrow the match funds for 30 years at zero percent interest. A federal transportation bill now in congress, which appears likely to pass, will make bridge and highway building loans (but not for land purchase) available for building bike trails. An additional cost, for which we are recommending the City Council make a commitment in the next budget cycle, is for grant writing. The City should budget $15,000 for grant application costs for the two trail proposals, according to executive director, Gary Helfrich. As of May 2016, the multiuse feasibility study is a line item in the Capital Improvement budget with zero funding. Nothing will happen until this is funded. April 19, 2016 Council meeting to approve a $70,000 bid to design the local street bike markings. The bid was approved in spite of safety concerns by bike experts about the designs for several streets and question s about the need for others. February 19, 2016 Council meeting. Multiuse trails discussion and action originally on the Council agenda for the staff proposals requested December 1, 2015 was removed several days prior to the meeting and postponed until after the next budget cycle. A request for bids was approved for the engineering design of the local street bike markings. 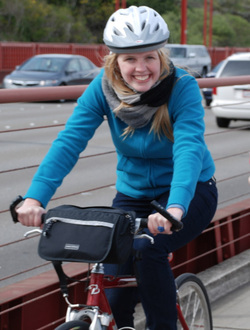 December 1, 2015 Council meeting to give bike infrastructure direction to staff. Council kicked the multiuse trails can down the road again. Councilperson Slayter and Gurney encouraged completing all project in the Bicycle and Pedestrian Master Plan before addressing multiuse trails. The Council declined to have volunteers do outreach to community members concerned about bikers and walkers using public areas, mostly on their street. Staff was directed come up with a plan using professionals, to get price quotes, and return with a plan for addressing this issue. This is essentially the same direction given staff for trails over a year before. August 4, 2015 Council meeting to set priorities for bike infrastructure. While the desirability of multiuse trails across town was discussed the primary focus was on completing projects already in the City’s Bicycle and Pedestrian Master Plan. Several Council comments mentioned the community’s desire “to do something about bicycling in town,” in effect equating markings on roads with multiuse trails. Postponed any decision until after the Hwy116 bike lanes grant results was known in November. January 5, 2015 Council meeting to discuss the $200,000 Traffic Impact Fee money that was not used for a match to the Hwy 116 bike lane project, as the grant was not awarded to the City. Rather than put this money back in the Impact Fee account the money was directed for use to complete all other road markings for bikes in the Master Plan, which are mostly residential streets in the town core area. This was a very large dollar commitment with little or no public input. Lynn couldn't help but agree. The narrow shoulder along Highway 116 is a terrible, if not a downright harrowing bike path. And so, Lynn joined the crush of morning traffic to take Corrina to school, adding yet another vehicle to the 7am congestion in front of Analy High School. Lynn contacted the Sonoma County Bicycle Coalition and asked them why they don't develop some decent bike trails in Sebastopol. Their response was, "Why don't you?" And so, the process began. You have to see through the developed property. The process involves walking streets, looking over fences, and talking to people to see what they think. Evening work is exploring Google Maps looking for pieces that could fit together. Plus, another tool that really helped -- an ultralight aircraft that can drift around in the sky at 30 mph. This proved particularly useful for finding possibilities in County area. This resulted in a possible Willowside School connection, a scenic connection to Cotati, and several extensions of the Gravenstein Trail. We are a group of volunteers and Sebastopol residents who believe a better biking and walking infrastructure is important to our town's quality of life. We are committed to finding more ways for our children to safely ride a bike to/from school and town. We have spent several years developing detailed proposals for off-road bike trails in and around Sebastopol, and a trail head park. Read more about us below. 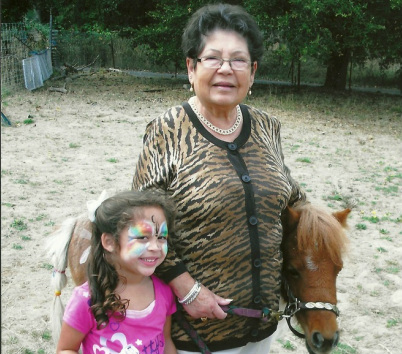 Lynn Deedler was a Sebastopol apple farmer, long ago. When the apple market collapsed, he planted Christmas trees. County Christmas Tree Farm soon became the largest tree farm in Northern California thanks to its idyllic location and lots of fun rides for kids. 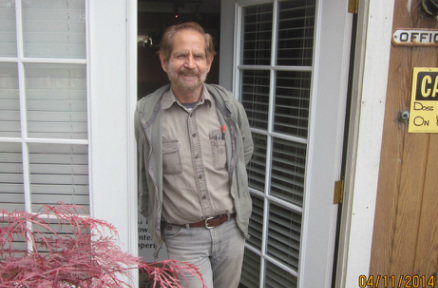 He also was a commercial building contractor, owner of “Apple Construction,” and has built a number of buildings in Sebastopol. He now enjoys the retired life with his wife, Barbara, works on community projects, and sails big boats. Jim Fain is a senior civil engineer for Carlile/Macy currently overseeing the infrastructure development for a Hunter's Point housing project in San Francisco. He coaches youth league baseball and basketball, stays in shape, and in his “spare time” he works on bike trails. Jim and his wife Lisa have three boys (including youngest son, JJ, pictured here with Jim). Larkin Morgan believes getting from one place to another place should be safe and enjoyable. You might have seen her riding around Sebastopol with a young passenger on board her longtail bike. After taking a necessary break from cycle transport until her youngest baby was old enough to be on two wheels, she continues her experiment of living as a one-car family in a car-centric world. Larkin envisions a day when everyone can give and receive as many smiles as she does while walking, cycling or riding an electric wheelchair on the way to the grocery store.